When Kim received a devastating diagnosis for uterine cancer, her world turned upside down. Through her treatment, she has struggled to cope with her changing body image in positive ways. 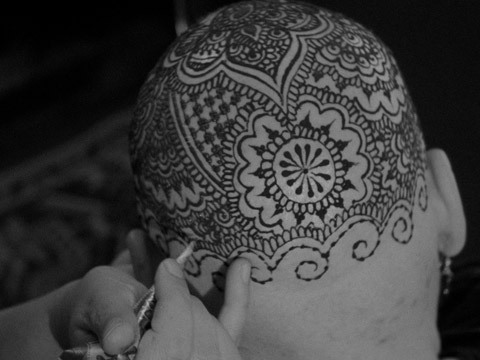 Taking an unconventional route, Kim decides to turn her baldness into a blank canvas for self-expression, and in doing so creates a powerful statement that allows her to share her experience with others. Sarah Berkovich received her undergraduate degree in documentary film production at Emerson College in 2010. While in Boston, she worked at MIT as a videographer for the Nextlab Initiative, and as a production assistant on an American Experience episode. Sarah spent a summer in Los Angeles interning at the International Documentary Association, where she helped coordinate Docuweeks, an Academy-nominated theatrical showcase. She currently is working on her MFA degree in documentary film and video at Stanford University. Sarah is passionate about documenting oral history, and one day hopes to teach documentary filmmaking in addition to being a producer.